Hosting a party is one of my favorite things to do, but I know for a lot of people, just the idea of hosting a party is overwhelming. 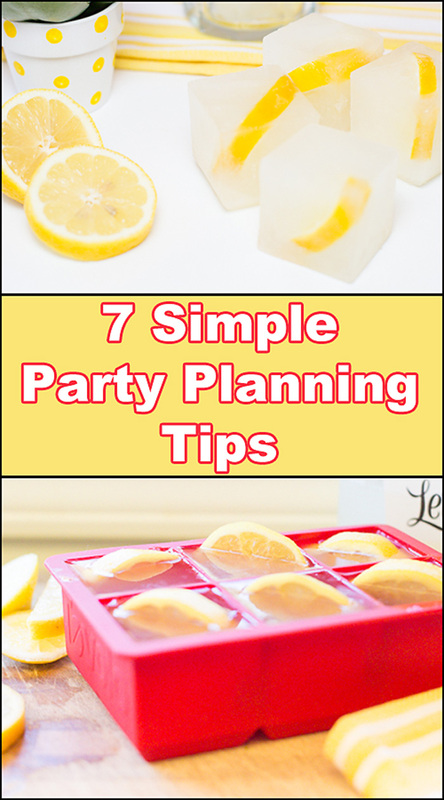 Today I’m sharing just a few of my tips that make party planning fun and simple! These are all tips that I follow for every party I host! These are definitely geared towards hosting showers, but can be adjusted for any party. Follow these 7 Simple Party Planning Tips to ensure all your guests feel welcome and have a great time, all while hosting stress-free! 1. Plan your menu days in advance. One to two days before the party, do your grocery shopping. If the party I’m hosting is large, I will often break up my shopping into two trips. I buy all non-perishables days in advance, then the day before the party I do my last grocery store run. That list includes perishables and any last minute items that I may have forgotten. And, the best tip of all: if the party is large and you’re doing a Costco run (especially for beverages), go when you can bring your husband along to help with the loading and unloading. 2. Clean the house! A few days in advance, clean the house. Make sure that every room is guest ready! The day of (or the day before depending on how many are in your household), do last minute tidying up, trash emptying, etc. Don’t forget to replace toilet paper with full rolls (nothing worse than guests having to look for an extra roll). Put out clean towels in the guest bath. 3. Dishware, glassware, and silverware. If you’re anything like me, you prefer to use real dishes, glasses, and silverware. I think it adds a special touch to parties! I always pull out all dishes, etc, the day before. If you’re using paper products, go ahead and unwrap them the day before. It will save a few minutes on the day of the event. 4. Much of the food prep can be done the day before. 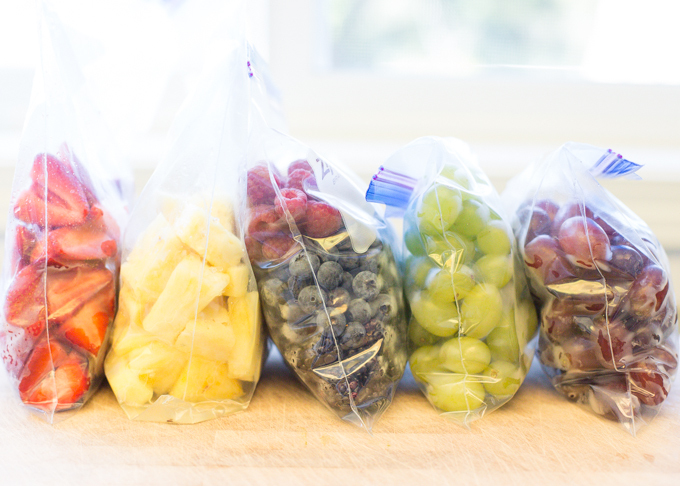 I always do as much as I can the day before, such as: if you’re serving a fruit salad or platter, prep the fruit and store in zip-lock baggies. Think through your menu, and do anything and everything that you can in advance. Here’s a few other things I’ve done: marinate the meat, prep fruits and veggies, make salad dressing, make the garlic bread (do not bake). 5. Ice cubes! Unless my party is a large outdoor event, I often serve some of the drinks (think iced tea and lemonade) in my large drink dispensers. There’s nothing worse than filling up the dispensers, adding in some ice to keep it cold, only to have the ice melt and water down the drink. Make some ice cubes! 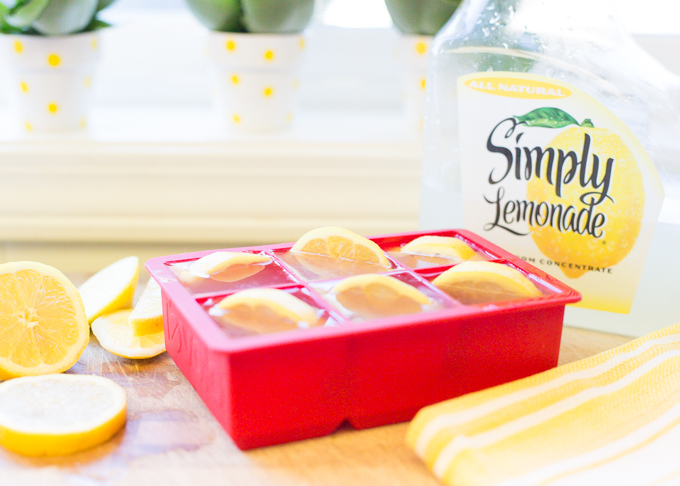 I’m always making tea or lemonade cubes to add to my dispensers. You can fancy them up with some added fruit, or freeze just the juice. I have lots of plastic ice cube trays, including a few that make jumbo cubes. Another thing I’ve done is slice up a bunch of lemons/limes and freeze those in baggies. 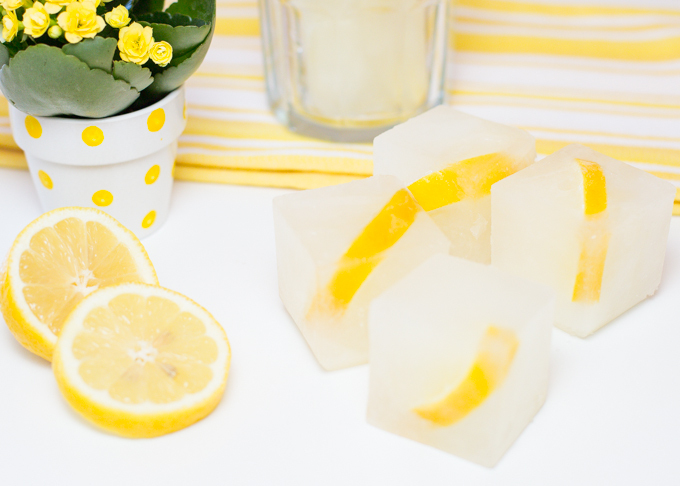 They look so pretty floating in lemonade and also help to keep the beverage cold. Make your cubes the day before. 6. Be a good hostess. These might sound so obvious, but I can’t tell you how often people tell me that “I think of everything.” Where are your guests going to put coats/purses? Do you have a spot designated for gifts? Do you guests feel welcome the moment they arrive? I always greet my guests at the door and take coats/purses. I let them know where to place their gift (assuming it’s a shower or birthday party), and let them know to help themselves to a beverage. I want my guests to feel at home and comfortable! Is your front porch inviting? 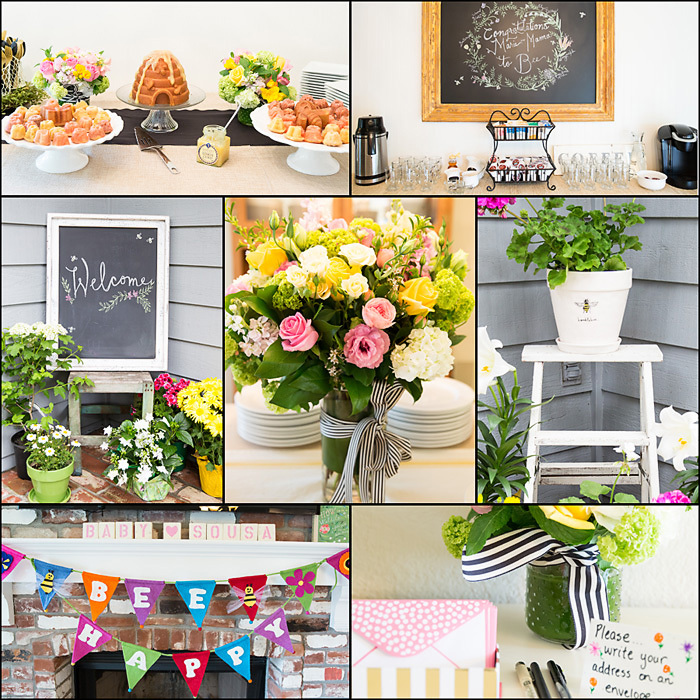 A few freshly potted plants or a welcome chalkboard are always inviting. 7. Consider the layout. I’m fortunate, that my home is fairly large, and a great layout for entertaining. I typically have multiple drink stations set up: one for coffee/tea, another for non-alcoholic, and a third if I’m serving beer/wine/mimosas. The main food (brunch, lunch, dinner) is set out on the dining room table. The dessert is set on a smaller table or hutch top. I don’t have seating options for the size of parties I typically host, so we “sit around” in the living and family room, then gather into the family room for gift opening. If you don’t have all the spaces, think creatively. How can you set up and keep a “flow?” Can your guests move around comfortably and does your “flow” encourage mingling and getting to know one another? and lastly…… sorry, I couldn’t stop at 7. 8. Details, details, details! This is where hosting a party is FUN! Is there a theme to your party? It doesn’t need to be elaborate, a color scheme can even qualify as a theme. You’ll see by my images, that I love the details. Here’s a few detail shots from three different showers. They all happened to be baby showers. 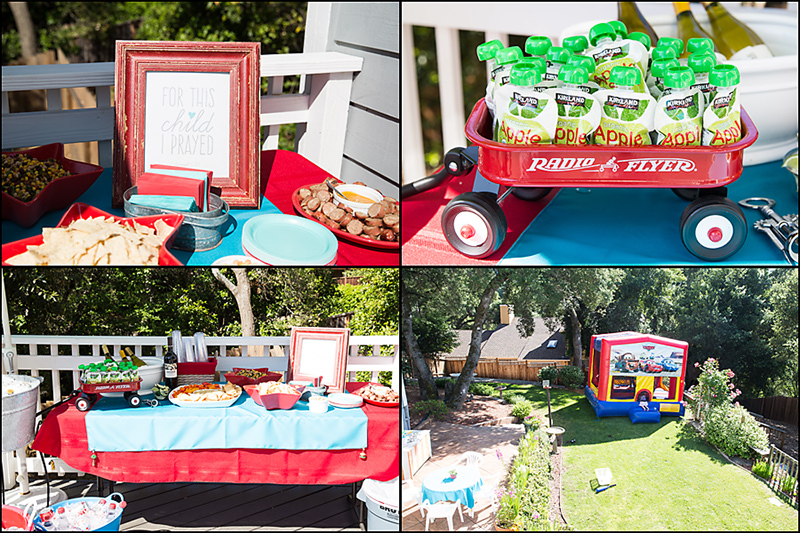 The “Red Wagon” themed party was for my daughter. She was expecting her third child, but her first boy! He needed celebrating and what’s more perfect than little boys and wagons? This shower was a fairly large family & friends afternoon BBQ party. We had a jump house for all the little ones and sent them home with party bags. 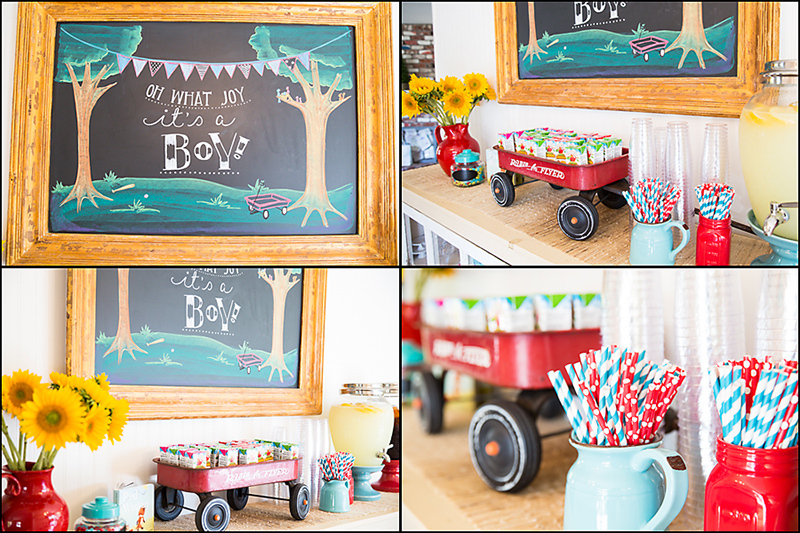 I carried the wagon theme, along with lots of red & turquoise throughout both the indoors and outdoors. Next up, was a luncheon baby shower for one of my best friend’s daughter who was expecting twin boys!! So much fun! These sweet baby boys were just born this week! I used their “Jungle” nursery theme as the shower theme. 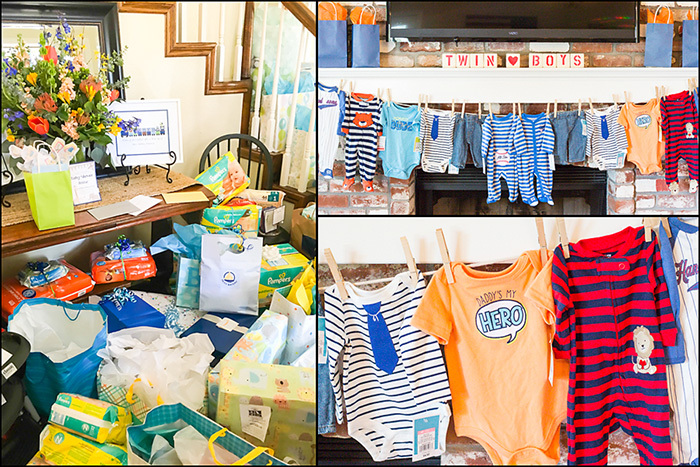 And, just this past weekend, I hosted a baby shower for one of my daughter’s best friends. She’s expecting a baby girl! 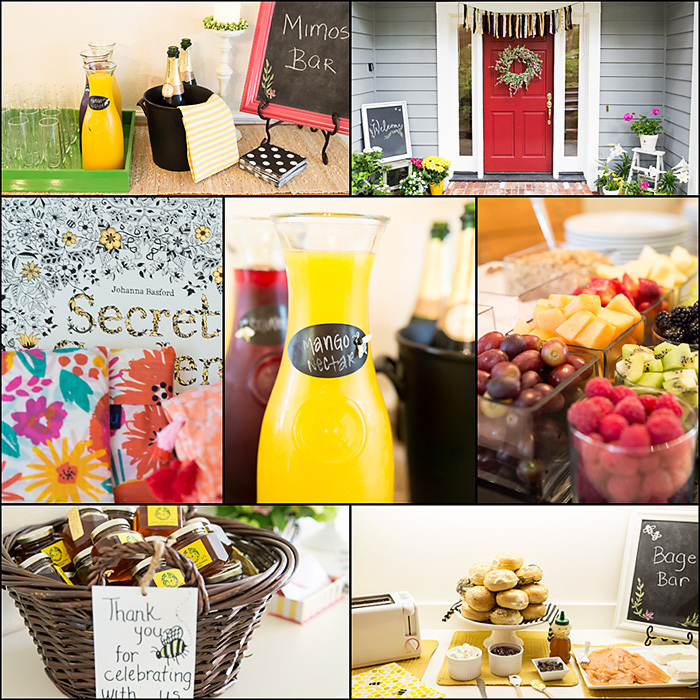 Again, I used the nursery theme of “Bee’s and Wildflowers” for this brunch shower. Lots of white dishes. I have cupboards and garage shelves full of dishes, and the majority of them are white. Well, I should say that the serving pieces are mostly white. Well, and my entertaining plates. White dishes match everything! Any color theme that you’re going with matches white! 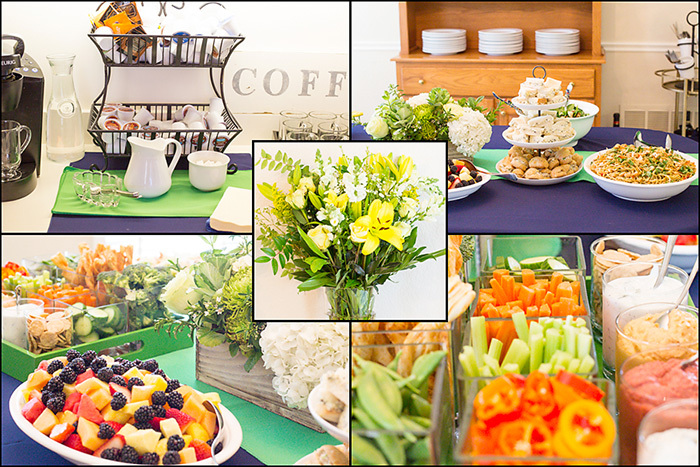 I typically pull color into the table set ups with linens and flowers and use all white serving dishes and plates. 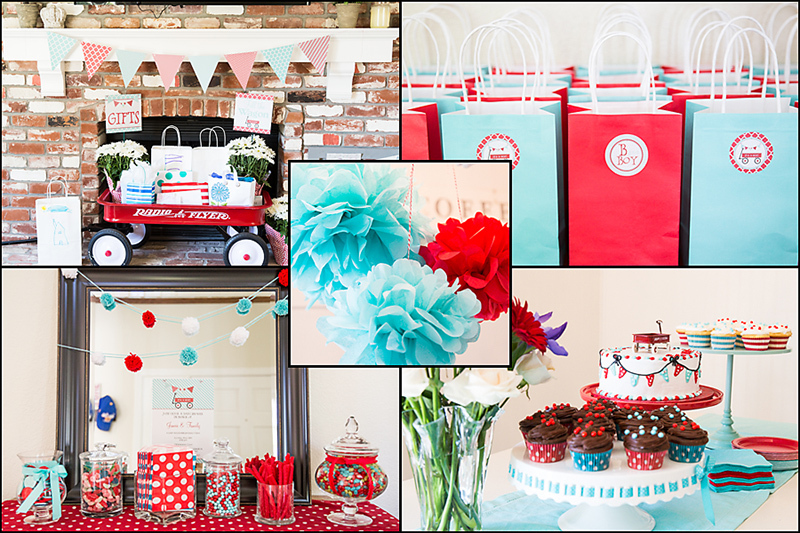 You will notice on the “wagon” themed party that I used paper products and lots of turquoise & red. This particular party was outdoor eating with lots of little ones, so paper plates made sense. As for the all the red & turquoise, well, I just couldn’t help myself and I happen to have a lot of both those colors. Typically, however, you’ll see lots of white. And, lastly (again), and maybe most important……except help when it’s offered to you! Even if you aren’t officially co-hosting the party, if someone asks if they can bring something, or if there’s anything they can do, let them. Absolutely! I hope you’ll be able to put a few of my tips to use at the next party/shower you host, and, that you’ll be able to enjoy your next event stress free. Thanks for sharing this. I really like your point about having fun with the little details. 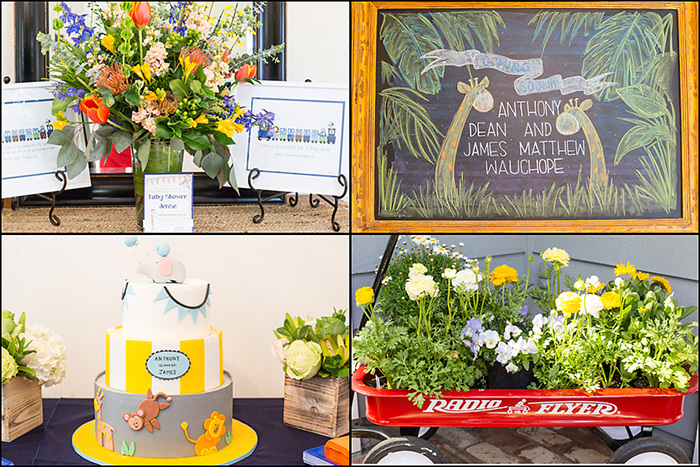 No matter how specific the theme may or may not be, finding little ways to add to the experience can really make the difference in how memorable your event is. All wonderful ideas! I do have lots of white plates, but I’m not nearly as organized! Definitely saving this!